In “Crimson Tide” Capt. Ramsey (Gene Hackman) applauds Lt. Commander Hunter (Denzel Washington) for not speaking as they enjoy the sunrise and some cigars in the moment before their nuclear submarine submerges. “Most eggheads,” Ramsey explains, “want to talk it away.” That line kept jumping into my head while watching “13 Days in France”, Claude Lelouch and François Reichenbach’s documentary chronicling the 1968 Grenoble Winter Olympics. As an American accustomed to NBC’s stable of talking heads trying to impose a narrative, where Tom Hammond would say “we’ll say very little” in the moments before dramatic figure skating routines only to have his announcing cohorts still say a whole lot, I am accustomed to eggheads who want to talk the Olympics away rather than simply kicking back and marveling at the feats of strength. Lelouch and Reichenbach, bless their souls, do not talk it away, rejecting narration. Their crackling film is very much made in the style of the French New Wave, also rejecting any kind of classical narrative for a sort of fragmented subjective realism instead, which is just right. The Olympics should never be about having meaning imposed on them by some random arbiter but by the spectator or viewer. At one point, Lelouch and Reichenbach’s focuses on an ABC cameraman – looking through his viewfinder so intently that the cigarette he is smoking winds up ashing itself – which seems to suggest a flipped perspective, us imposing the narrative rather than them. 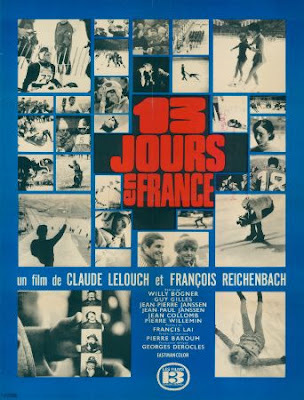 As a title card makes clear, “13 Days in France” is not an official Olympics film. It was not specifically commissioned by anyone other than the filmmakers themselves, and it does not strictly limit itself to the Olympics, often cutting away from the competition for snippets of the celebration that go hand-in-hand with the Games. And while myriad athletes are repeatedly seen at the height of their powers, Lelouch and Reichenbach also indulge in moments of various sportspersons in something like competitive repose – a hockey player yawning, a skier waddling across the snow to retrieve a lost ski – reminding us that even do-or-die sporting events involve downtime. French athletes might be central, but “13 Days in France” forgoes nationalist notions. Indeed, if the torch relay, as any amateur Olympics historian will tell you, was originally conceived not by the Greeks but by, yes, Hitler and his Third Reich for the 1936 games, Lelouch and Reichenbach do not employ the relay to intone “Vive la France!” Rather their wordless poetry reclaims the torch relay as a kids’ playground, not just in so many youths carrying the flame but in moments of children and parents horsing around in the snow as the torch passes, evoking a celebration of innocence. A longhaired dachshund frolicking in the snow might have been a nod to Germany, I have no idea, but I preferred to imagine it merely as a cosmic accident. The torch relay follows the New Wave’s lead by opting out of pesky establishing shots to simply establish mood with close-ups of cold faces instead, a technique copied elsewhere, such as in the smiling faces of young girls in the lead-up to figure skating or setting the stage for luge with ominous close-ups of faces in shadowy shots, getting themselves together before hurtling down chutes of ice at ridiculous speeds on tiny sleds. And if TV coverage often limits luge, as well as bobsled, to the same angles, causing it to unfairly feel repetitive, here Lelouch and Reichenbach change the angle in nearly every shot, each one coming a split-second after the other, enlivening the perspective and making every whoosh of the sleds feel overpoweringly fresh. At the ski jump hill, meanwhile, they find new and exciting means to convey the sport’s majesty, never more so than shots from behind the point of takeoff so that we literally see the jumpers disappearing over the hill, reminding you how these men and women are essentially jumping into nothing. Most of the athletes here remain anonymous, save for the high voltage stars, like Jean-Claude Killy who is not even ushered in with a subtitle or some such, so obvious is his importance, as he introduced amidst others clamoring for his attention. And that is how “13 Days in France” mostly frames the French skiing hero, as an object of affection, with TV cameras reveling in his visage and fans demanding autographs. His races, presented as mere blips in-between, feel almost beside the point, which the snowy fog he skis in during his Gold Medal slalom run seems to illuminate, as if on the course he is a ghost, just another skier, until he crosses the finish line first, at which point he is elevated to immortality. Then again, the athletic ability of Grenoble’s other star, American figure skater Peggy Fleming, is lingered over, dispensing with the sport’s inscrutable scoring by setting the camera at ground level and watching her skate, spin, and soar. (It also reminded me that once upon a time figure skating was contested outdoors which just feels more aesthetically enchanting.) The film, however, scores her triumph to a song by Frances Lai with melancholy lyrics by Pierre Barouh in which he laments a consumerist American society inevitably commercializing this iconic moment rather than simply savoring it, a contrast that makes her astonishing tear-stained close-ups of wide, blinking eyes in the aftermath of winning as sorrowful as beautiful, improbably transforming All-American Peggy Fleming into a New Wave ingénue. Barouh also composes an in-movie song for Killy, which begins with a line about the skiing star conquering time. Conquering time on the course, sure, though it also got me to thinking about a time in more universal sense, and how for a fortnight, the Olympics and their stars can kind of conquer time on our behalf, like we are suspended in a captivating athletic dream. And a dream state is what the film’s montage style and rapid-fire editing suggests, until the conclusion, which creeps up because of the film’s anti-narrative structure and then suddenly is just there, rousting us from our dream, leaving us with nothing to hold onto but those abundant little flashes, so many remarkable instants seared into the memory.